The Collinsville City Commission met Monday, Jan. 21st (at the City Hall Community Room, 106 N 12th Street) for a 7pm regular of the Municipal Authority & City Commission. A. Approval of minutes of the Collinsville Municipal Authority Special Meeting of December 26, 2007. B. Approval of minutes of the Collinsville Municipal Authority Regular Meeting of January 7, 2008. D. Supplemental Appropriation in the amount of $750.00; Reimbursement for surveying services for Victory Energy Plant. FEMA brush assessment conducted Saturday (Jan. 19) estimated 50,000 cubic yards collected or still curbside + another estimate of damaged limbs still hanging in trees overhanging city right-of-way. Animal Shelter grand opening Saturday Jan. 26th. Chamber of Commerce installation banquet Saturday Jan. 26th. Bids for additional storm recovery equipment will be on the Feb. 4th agenda. 8. Discussion and possible action to accept bid for material for Ashbury Park Development. -- after Mayor Sallee and Trustee Bateman recused themselve for any potential conflict of interest ... the remaining trustees approved the low bid of ~$103K by Stewart Irving. The only other bid received was for ~$125K. A. Approval of minutes of the December 26, 2007 Special Meeting. B. Approval of minutes of the January 3, 2008 Emergency Meeting. C. Approval of minutes of the January 7, 2008 Regular Meeting. D. Approval of minutes of the January 17, 2008 Special Meeting. E. Approval of disbursements and payroll. F. Approval of cemetery deed: Jim Lambert, two (2) spaces. 5. Discussion and possible action on New Animal Shelter. -- Dr. Susan Babbit addressed the city commission on the realities of wishing for a no-kill facility -vs- the problems if the shelter over fills. The Friends of the Collinsville Animal Shelter (FOCAS) will work out the shared operational roles and responsibilities with the city soon via discussions with the City Manager and Police Department (which operates the old shelter). Babbitt suggested considering the old shelter be used for temporary isolation of new animals so they could be evaulated by local vets before locating to the new shelter. The new facility will open Jan. 26th with 14 dog runs and 16 cat "condos". Susan stressed that although FOCAS has directed the effort to build the shelter, the building belongs to the City of Collinsville. Babbitt promised an agressive adoption program (inculing monthly programs at the shelter & online listings) to help animals get new homes. 6. Discussion and possible action concerning Ordinance 806 to revise purchasing in the event that competitive bidding is not required when the City Commission of Collinsville or Collinsville Municipal Authority declares an emergency to preserve the health and welfare of the City of Collinsville. -- approved -- these revision have been pending for some time and will be used for future emergencies but were not available for the ice storm. for ice storm damages. -- a $1.5 million line of credit with Bank of The Lakes at 4.2228% was approved. RCB Bank and American Bank also submitted bids but at higher rates. Steven Barnes, a new executive with Bank of the Lakes attended the meeting. 9. Discussion and possible action to enter into Executive Session as allowed by O.S. 25, 307 (B)(4). 8. Discussion and possible action on matters considered in Executive Session. -- The commission hired Angela Long as the new City Clerk and Lori Stephens as the new City Treasurer. POSTED 1/18/2008 by Angela Long, Acting City Clerk. 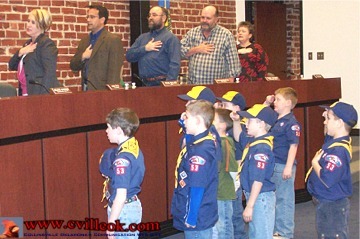 Pack 53 Scouts led the pledge for the city meeting.